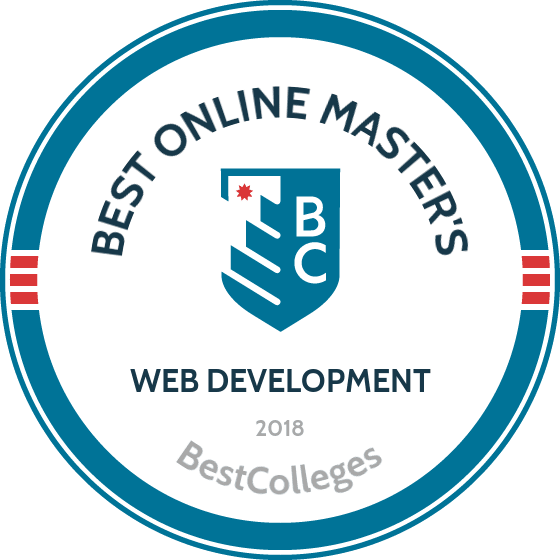 What Are The Best Online Master's in Web Development Programs? What Else can I Expect from an Online Master's in Web Development Program? Web developers are currently in great demand on the job market and that demand continues to grow. As a web developer, your responsibilities include creating websites and web applications, which necessitates training in both programming and graphic design. Most web development jobs require at least an associate degree, but an advanced degree can lead to more opportunities with higher salaries. The Bureau of Labor Statistics reports that the number of web developer jobs is expected to grow by 27% between 2014 and 2024, which is much faster than the average job in the U.S. This burgeoning field is full of excellent opportunities; pursuing a master's in web development is an investment in a promising future. Located in Gainesville, Florida, UF is one of the state's flagship universities. The school offers a 37-credit online MA in mass communication degree with a specialization in web design. Graduates are prepared to pursue careers in web design, graphic design, digital media, and other web management fields. Students can earn their master's in web development degree in two years of full-time study. Courses are delivered asynchronously online, allowing students to complete coursework at their own pace. This online master's in web development is a part of the school's Metropolitan College, which offers affordable programs that are ideal for part-time adult learners. All online students pay the same tuition rate, regardless of residency. BU is accredited by the New England Association of Schools and Colleges. UD's University College offers a variety of programs that are ideal for working adult students. One of these programs is the school's MS degree in web design and development. The curriculum includes three capstone courses: a capstone seminar, an interdisciplinary seminar, and a project that allows students to gain a taste of working in the web development field. Graduates are prepared to pursue a variety of careers in UX/UI design and web programming. High school applicants must have a bachelor's degree with a minimum GPA of 2.5, while transfer students must have a minimum GPA of 3.0 in all graduate level coursework to be considered. Applicants do not need to submit standardized test scores. UD is accredited by the Higher Learning Commission. SNHU has earned nationwide renown due to its wide range of distance learning programs. The school offers a 36-credit MS degree in information technology with a concentration in web design that consists of 12 courses. These 12 courses include studies in operating systems, technical communication, and database design. Courses are delivered asynchronously online, allowing students to access class materials 24/7 and complete coursework at their own pace. Graduates with the master's in web development at SNHU can pursue careers as web developers, designers, and administrators. Students can earn their degree in just 15 months. Applicants must have a bachelor's degree and submit a professional resume to be considered. However, they do not need to submit GRE or GMAT scores. The school accepts applications on a rolling basis, and applicants receive an admission decision within days of applying. FHSU's central focus is distance education. The school offers a master of professional studies in web development program that is one of the best online master's in web development programs in the nation. This 30-credit program includes a three-credit, hands-on project in informatics. The curriculum also includes courses on cyberspace law, iOS programming, and other foundational web development skills. Students must also complete an internship experience and pass a comprehensive exam to graduate. Courses are delivered asynchronously online, allowing students to complete coursework at their own pace. Students can begin the program at three different times throughout the year. FHSU's web development program is transfer-friendly, accepting most credits earned at a regionally accredited school. All online students pay the same tuition rate, regardless of residency. FHSU is accredited by the Higher Learning Commission. Master's in web development programs cover advanced techniques and information that can help further your career. When you compare different master's programs, you will notice that the exact details of the coursework vary depending on the school and specific type of program. The following courses are examples of what you can expect to find in the curriculum of a master's in web development program; however, the exact courses differ somewhat depending on the college and degree concentration. Website Construction: This course covers how to design, build, and manage interactive websites, which is the core of any web developer's responsibilities. Students also learn an overview of technical and design aspects, preparing them to construct well-structured websites that meet technical standards, function smoothly, and are easy to navigate. Interface Design: Students learn how to design user-friendly interfaces for web applications and gain an overview of evolving usability standards and best practices. They also learn to identify strengths and weaknesses in a site's design, detect technical problems and accessibility issues, and improve performance and navigation. Web Analytics/Optimization: This course teaches students how to build websites that attract traffic and increase profits. Students also cover the methods used to gather and interpret statistics related to a website's usage. Principles of Database Design: In this class, students design, develop, and implement database management systems. They cover each step of the design process, from concept to final product, while studying Structured Query Language (SQL) programming and optimizing functions such as searchability and data mining. Distance learners also complete projects that prepare them to design and maintain databases in a professional capacity. How Long Does it Take to get an Online Master's in Web Development? Most master's in web development programs consist of 36 to 48 credit hours. Some programs may be completed in as few as 15 months, although most take 18 to 24 months to finish. The differences in length and number of credit hours vary based on the requirements of a school and/or program. For example, certain concentrations requiring more specialized knowledge may contain more credit hours. Some programs also offer the opportunity to add graduate certificate courses, extending the program's completion time but providing additional professional qualifications that can help make you more competitive on the job market. The teaching style also affects the overall program length. Some programs use cohort learning, which is a traditional style where a whole group of students follow the same schedule. Other schools offer an individual pace, letting students begin a course at one of several starting points during the year and complete it at their convenience. Accreditation is one of the most important features you should look for when choosing a master's in web development program. An accredited school has been reviewed and found to comply with certain educational standards, assuring you and prospective employers that your degree is valid. Accreditation may be regional or national. Regional accreditation is the most popular and prestigious type. It is awarded by one of seven different agencies, collectively known as the Council of Regional Accrediting Commissions (C-RAC), each of which serves a particular geographic region of the United States. Credits and degrees from regionally-accredited programs are the most widely accepted and transferable. Nonprofit institutions are more likely to be regionally accredited. Alternatively, national accreditation is usually awarded to for-profit institutions like career and trade schools. The academic standards at these schools tend to be lower than those of regionally-accredited colleges; thus, national accreditation is viewed as a less prestigious designation. The U.S. Department of Education recognizes 10 agencies as providers of national accreditation, including organizations such as the Accrediting Commission of Career Schools and Colleges (ACCSC) and the Accrediting Council for Continuing Education and Training (ACCET). The U.S. Department of Education oversees these accreditation agencies and establishes policies for education, administers and coordinates most federal assistance provided to schools, and monitors national educational standards. The Department of Education receives guidance on these matters from the Council for Higher Education Accreditation (CHEA). The CHEA has a membership of approximately 3,000 colleges and universities and 60 institutional and programmatic accrediting organizations. They monitor the agencies that accredit schools, essentially providing a form of accreditation to those accrediting agencies. You can find a list of all accredited schools on the websites of the U.S. Department of Education or the CHEA. While web development jobs require varying levels of education, depending on the specific position, earning your master's in web development typically qualifies you for higher-ranking and better-paying roles. For example, a web developer with a master's degree may be eligible for promotion to senior web developer or software engineer; these roles tend to pay significantly more than those requiring a lower level of education and experience. Additionally, a graduate degree generally increases your chances of being employed; the Bureau of Labor Statistics reported that, in 2016, workers with a master's degree had an unemployment rate of 2.4%, which is better than the overall average of 4%. Although the most significant factor affecting the wages of web developers is their level of experience, certain states offer higher median salaries for this field. The following table features data from the Bureau of Labor Statistics, showing the states with the top five mean salary rates for web developers. These states have a high concentration of web, media, and government jobs that require high-quality web development work. Be aware that holding a master's degree may allow you to obtain higher-ranking jobs and earn a better-than-average salary. Web developers can pursue a variety of computer-based careers. When you earn your master's in web development and gain professional experience, you tend to increase your opportunities for advancement to senior positions and management roles. These are full-time positions in the public and private sectors where professionals primarily work in an office environment. Depending on the size of the company, these roles may be performed alone or as part of a team. Web developers create websites and other web applications. They handle the technical features and are sometimes responsible for design aspects. This requires training in both web development and graphic design. A master's degree in web development gives you more advanced tools for building web applications and may help you advance to senior roles, particularly in companies that employ multiple web developers. Software developers create computer programs, which can range from business applications to games to operating systems. Most software developers have a bachelor's degree, but earning a master's degree may make senior and supervisory roles more accessible. When software developers create programs, computer programmers write the actual code that allows software to function. Code is written in a programming language, which the computer translates into instructions it can follow. A bachelor's degree is typically needed for an entry-level computer programming job, but a master's degree can lead to senior positions. Computer and information systems managers oversee an organization's computer-related functions. This position is also referred to as an information technology (IT) manager or project manager. A manager directs a team of employees, which often consists of software and web developers, programmers, and hardware technicians, to ensure an organization's technological needs are met. These management positions generally require a bachelor's degree and professional experience, although many people in these roles hold a graduate degree. Database administrators manage computerized data storage, ensuring that it is safe, orderly, and accessible to the proper parties as needed. Maintaining the integrity and security of data is an administrator's primary goal. Database administrators usually hold at least a bachelor's degree, but an advanced degree may provide a competitive edge on the job market. Almost every college student uses some type of financial aid to help pay for their education; aid comes in the form of grants, loans, scholarships, and work-study programs. When you fill out the Free Application for Federal Student Aid (FAFSA) form, the results help you understand which financial aid opportunities are available to you. Many private scholarships also require applicants to fill out the FAFSA. High-demand fields, such as web development, often have special financial aid opportunities for students who are willing to work in certain areas. In addition to providing financial aid, these opportunities can help you land your first job working in the specialization, organization, or community in question.